FIGHTER Virtual Aircraft Museum / Poland / P.W.S. 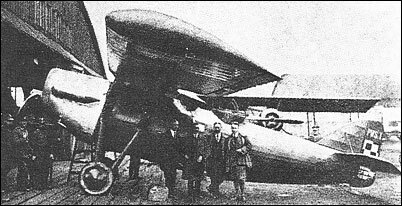 Evolved by the Podlaska Wytwornia Samolotow (Podlasian Aeroplane Plant), or P.W.S., to meet an official requirement for a fast two-seat reconnaissance fighter, the P.W.S.1 parasol monoplane was designed by a team led by Stanislaw Cywiriski and first flown on 25 April 1927. Of wooden construction apart from a steel-tube forward fuselage, the P.W.S.1 was powered by a 450hp Lorraine-Dietrich LD 12Eb 12-cylinder water-cooled engine and carried an armament of two fixed synchronised 7.7mm guns and two similar-calibre weapons on a Scarff mount in the rear cockpit. In the latter half of 1927, the aircraft was extensively re-designed and rebuilt as the P.W.S.1bis, flight testing being resumed early in 1928. The P.W.S.1bis featured an entirely new wing and new vertical tail surfaces, empty weight being reduced marginally but performance remaining virtually unchanged. As the aircraft held little promise of any major improvement over existing Lotnictwo Wojskowe equipment, further development was discontinued.